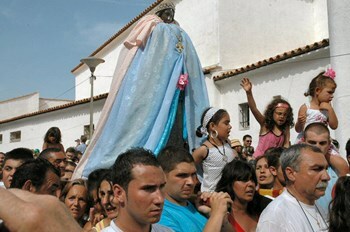 Every year in May the Gypsy elders are granted the privilege of taking Sara's statue out of the church's crypt and leading a procession to the sea. They are the eternal wanderers of the world. Some mysterious event, more than a thousand years ago, set them into motion. By the thousands they left their home in the Indian province of Sind and headed west. To those outside their nation, they are known as "Gypsies," a name that was branded on them in the Middle Ages, when they were thought to be natives of Egypt. Within their community, they are known as Roms, Sinti, Manush, Kale, Lovari, Kalderash and to the French administration as the "Travelling Nation" (Les gens du voyage). Every year, on the fourth weekend in May, they gather from all over Europe in Les Saintes-Maries-de-la-Mer, a seaside village in Camargue, some 35 kilometres south of Arles. They come to honour their patron saint, the humble "Black Sara" who was a servant to two of the closest companions of Jesus, the "Holy Women," Mary Jacobe and Mary Salome. How the three women came to be associated with a small village in the Camargue, an area of brine lagoons and reed-covered marshes created by the Rhône Delta, is the stuff of legends ... and of a bit of history. 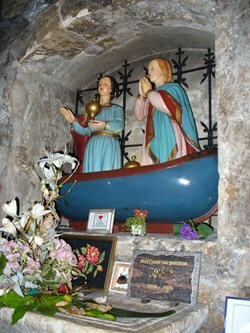 According to an ancient tradition, the ''Holy Women'' and their servant were set adrift in a small boat ''with no rudder or sail'' and miraculously traversed the Mediterranean to land on the coast of Provence. According to a very ancient tradition, the "Holy Women" and their servant, persecuted by the Roman authorities, were set adrift in a small boat "with no rudder or sail." Miraculously, they traversed the Mediterranean and landed on the coast of Provence. Upon their death an oratory was erected upon their grave. Fourteen centuries later in 1448 as the present-day church was being built on the old oratory's location, their remains were rediscovered, a new fervour ensued and a pilgrimage was established. Because she was dark-skinned like them, the Gypsies who arrived in Provence at about that time identified with "Black Sara" and elected her to be their patron saint. For more than two hundred years now, the Gypsy elders have been granted the privilege of taking Sara's statue out of the church's crypt and leading a procession to the sea where the saint's blessing is extended to the whole of the Gypsy nation. That's what will happen this Monday, 24 May and the following day, amidst much celebration, prayer, music and dancing. For an extended weekend, Les-Saintes-Marie-de-la-Mer will be the capital of a people without a homeland.